Order your Dupont Limited Edition Premium Phoenix Renaissance Ligne 2 Lighter today from FahrneysPens.com. Fine Pens, Refills & Luxurious Gifts – great prices & fast shipping. One might almost believe that the mythological Phoenix has been watching over S.T. Dupont ever since it was founded in 1872. It offered its wings to the master goldsmiths to adorn their hallmark and instilled in them a fervent love for fire that was transformed into an art. The Phoenix Renaissance Limited Edition is inspired by the legendary journey of the firebird that returns to the temple of Heliopolis, after being reborn. The Premium collection is distinguished by its smoky grey-black natural lacquer sprinkled with meteorite dust and highlighted with finely engraved details with palladium finishes. 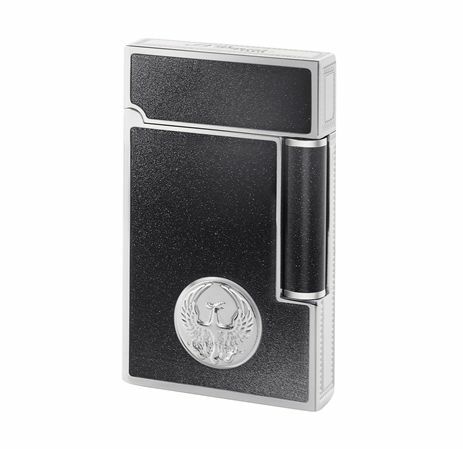 the Ligne 2 lighter features a double cigar flame with the perfect 'ping', a sound instantly recognized by those in the know. Each piece is presented in an an exclusive gift box and limited to 2,016 numbered pieces.